DEAR FRIENDS ! ! ! OUR AIM IN MFB IS TO TAKE OUR BE LOVED MITHUNDA IN HEIGHTS. AS WE ALL KNOW THAT DADA IS A KIND HEARTED PERSON AND HE DOES MANY SOCIAL WORKS IN OUR SOCIETY. SO ITS OUR PRIDE TO TELL THAT WE ARE FANS OF SUCH A PERSON WHO IS JUST UN COMPAIRABLE . WHILE SALUTING HIM FOR HIS ROYAL DEEDS . IS' NT THAT SOUNDS AMAZING . YA WE HAVE MAKE THIS TRUE . 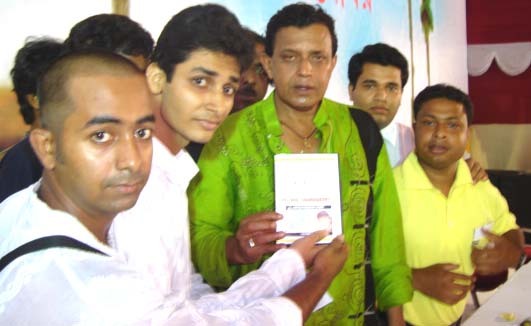 FROM NOW ON YOU ALL CAN WATCH PROMOS OF EACH AND EVERY MITHUNDA'S FORTHCOMMING MOVIES BOTH ( HINDI & BENGALI ) . ITS OUR AIM TO MAKE MFB FLY IN THE HEIGHTS .. FROM NOW ON YOU WANT JUST LOG ON TO OUR WEBSITE AND ENJOY PROMOS.ALL PROMOS ARE IN ( SWF ) MODE FOR PROPER PLAY BACK WITHOUT BUFFERING FOR LONG TIME. THIS ALSO FEATURES ( CPB ) . THIS FEATURE WILL HELP YOU TO SEE EACH AND EVERY PROMO AS MANY TIMES YOU WANT . ALL OUR ACTIVITIES ARE FREE OF COST FOR ALL. P - 2 , 128 MB RAM , 633 MHZ PROCESSOR With FLASH PLAYER 6. WE HAVE GOT MANY E MAILS FROM VARIOUS PLACES OF THE WORLD . SO LOOKING TOWARDS THEIR REQUEST WE HAVE CREATED THIS WEBSITE.WE HOPE TO COME UP TO THE EXPECTIONS OF ALL MFB MEMBERS. We MFB TEAM have obtained necessery consent / permission letter from the owners of the copyright of their films to view their promos in our website. MFB TV - A world wide based net video services. BROUGHT TO YOU BY MFB TEAM.